Side Note: We had about 8 people total for the dinner, it still yielded some left overs and I doubled or adjusted a few of the recipes as noted to accommodate everyone. On Wednesday I hit up Trader Joe’s and Whole Foods and picked up all the ingredients I needed for the recipes. 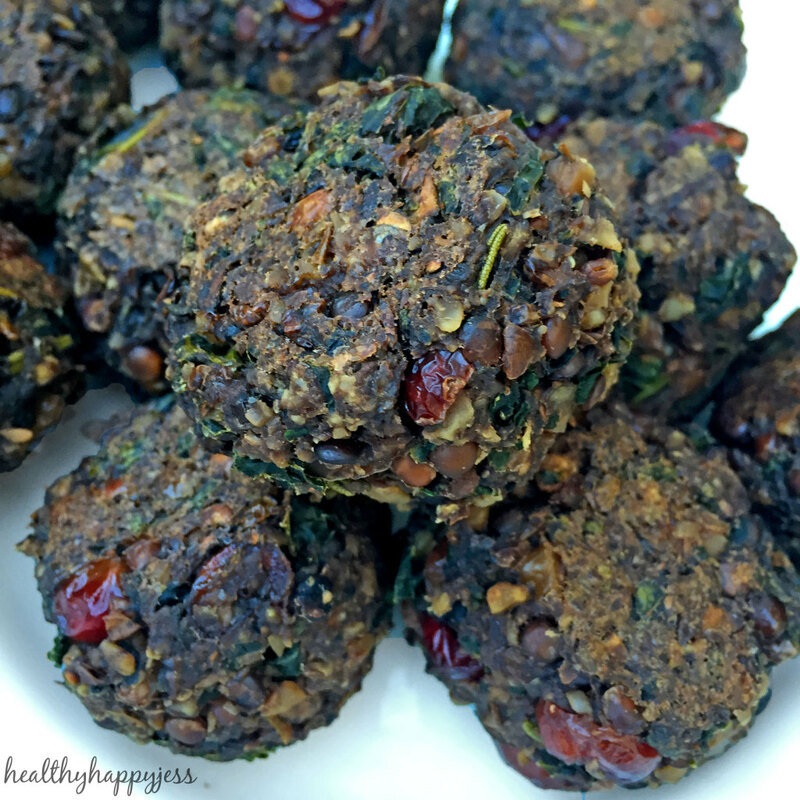 When I got home I prepared the Lentil Walnut Mushroom Balls and set aside in the refrigerator to bake on Thanksgiving Day. Next up, I made the pumpkin pies (the recipe recommended leaving them in the fridge the night before). Prepared the Kale Salad and set aside in the fridge until we set the table. 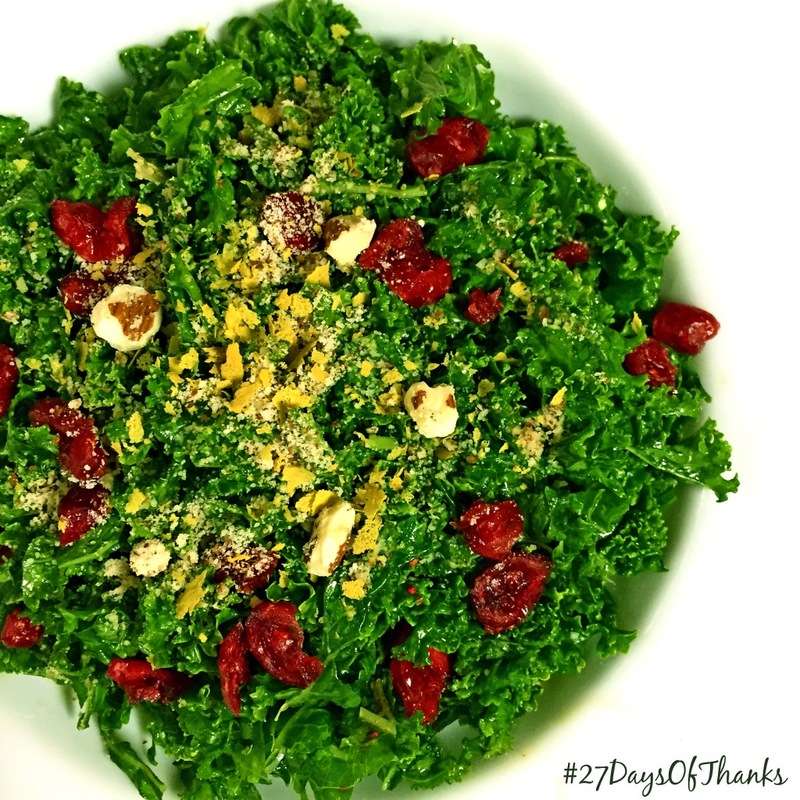 This is a simple recipe and mainly requires de-steming the kale leaves and then massaging them with half the dressing before tossing the rest of the dressing and ingredients on top. I ended up using my food processor to chop the kale leaves instead of cutting them with a knife, either one works, I just wanted it to be as simple as possible. I prepared the mushroom gravy (while preparing the cranberry sauce) and set aside. 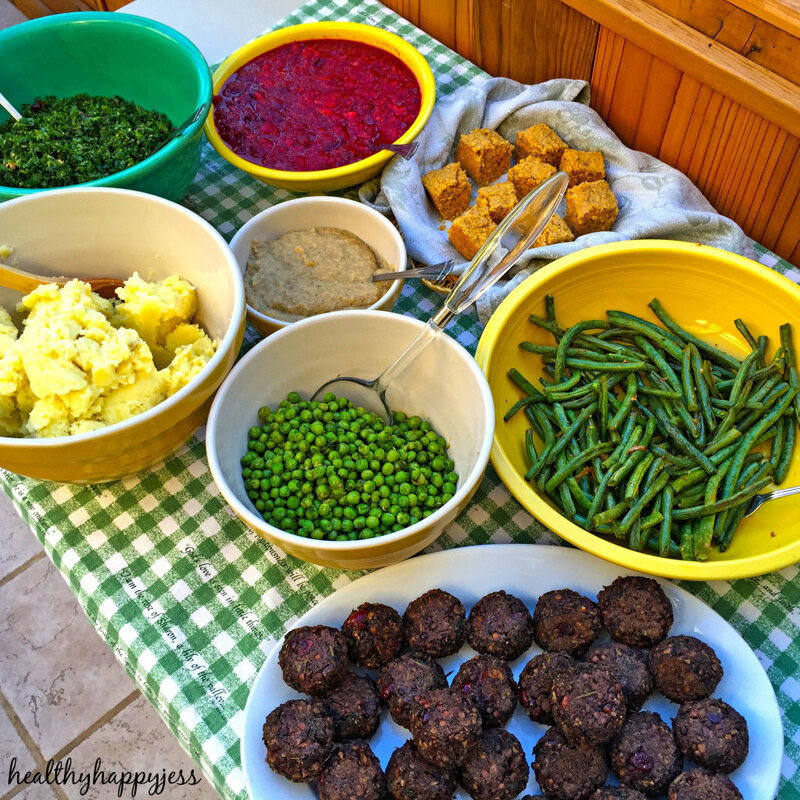 This is the healthiest gravy you can get! This recipe makes a lot of gravy, it could even stand alone as a soup if you wanted it to. The recipe link below is for mashed potatoes and gravy but I only made the gravy from this recipe, I made my own mashed potatoes which are super easy, and I will post as well. 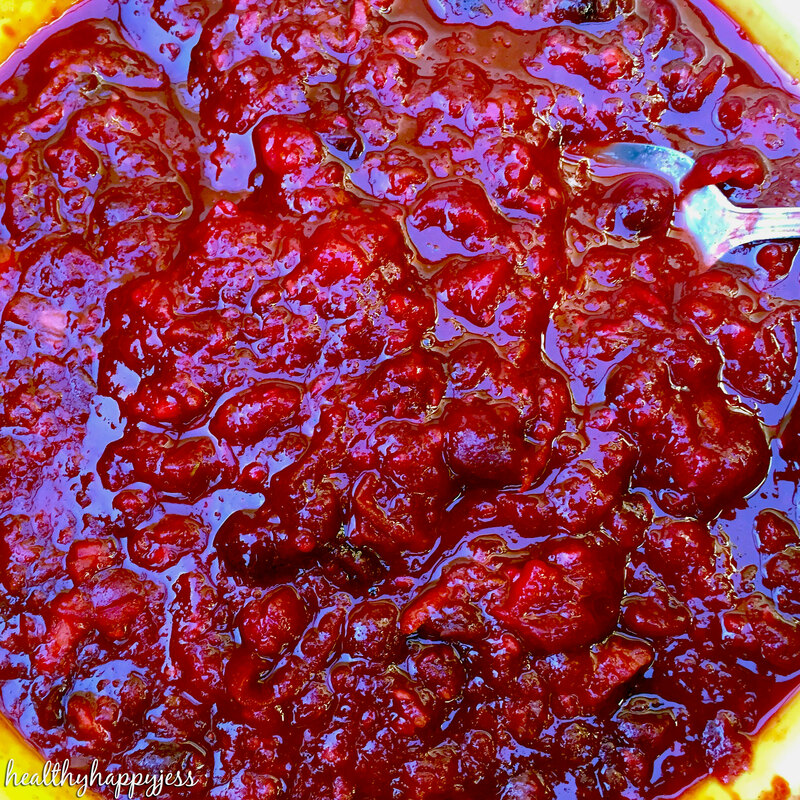 This cranberry sauce is such a treat! It’s so fruity and delicious it honestly could stand on it’s own as a dessert. I had fun munching on it while I was cooking everything else. I think I may have doubled the recipe so I’m not sure I followed it precisely, but it still turned out beautifully. 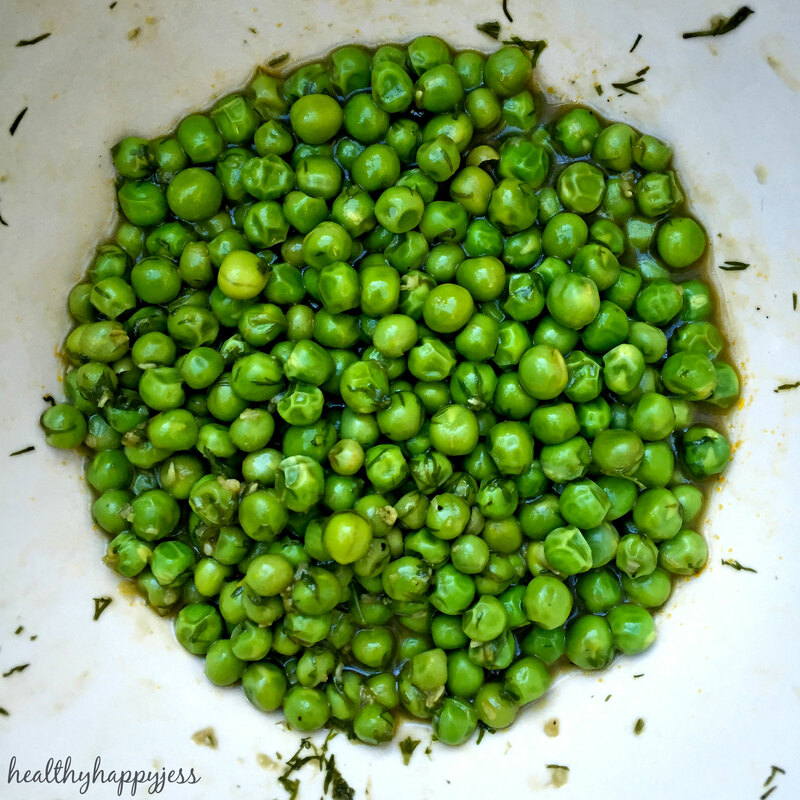 Made the peas then set them aside. For this recipe I followed it pretty loosely. I got two packs of peas from Trader Joe’s (in the refrigerator section) and I used garlic instead of scallions. This dinner would not have been the same without them, they were so good, especially with that fresh dill! 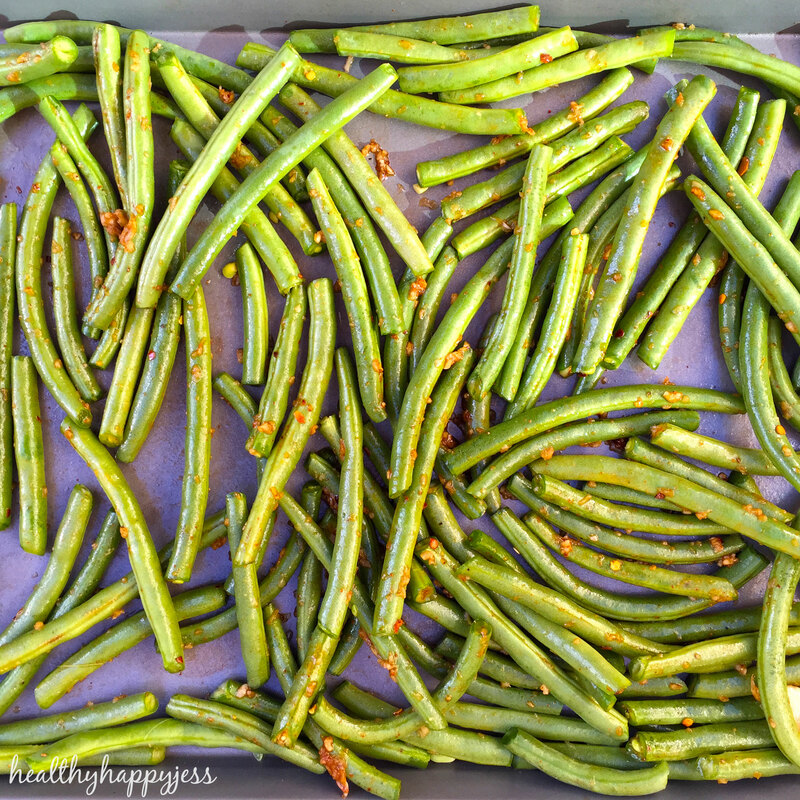 I have never baked green beans before, I usually sauté them in the skillet, but I wanted to try it to help simply the preparation. 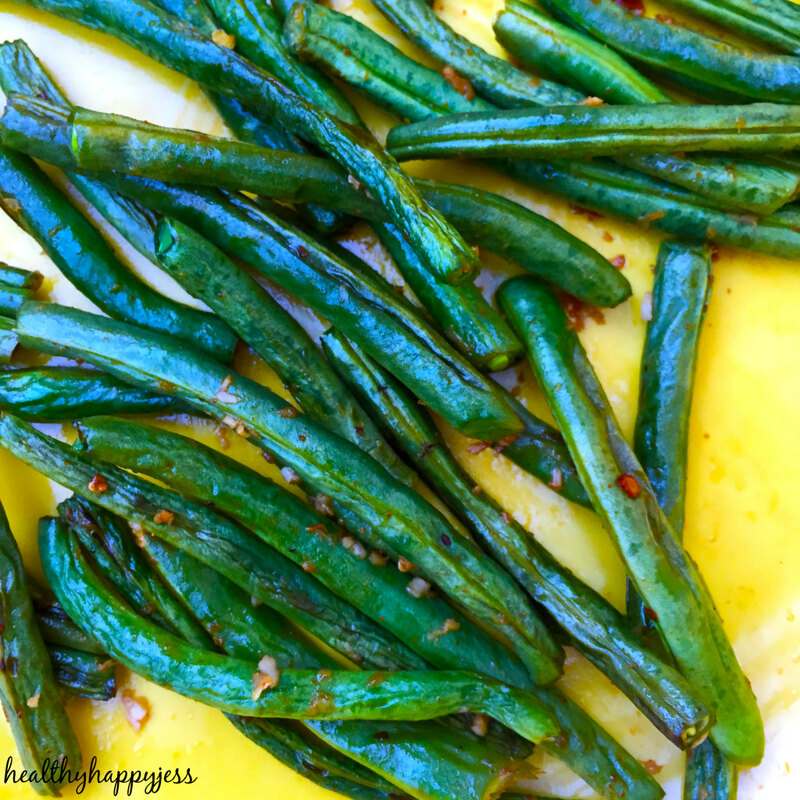 Although, they were tasty I still prefer using the skillet to make green beans. I prepared them on the cookie sheet until right before dinner then baked them. Note: This original recipe was not vegan, but I modified it to make it vegan by skipping the parmesan cheese. Note: I also always add a bit of spice (cayenne or red pepper flakes) and a bit of GF low sodium soy sauce to my green beans as well as garlic. The very last thing (while simultaneously baking the lentil balls) was to steam the potatoes for mashing. I use the most simple recipe to make mashed potatoes and it is always delicious, low fat and healthy. Recipe: Simply Steam Yukon Gold Potatoes (they are the most buttery and naturally creamy) then drain and set aside. In the same pot you steamed the potatoes add a few cloves of garlic along with a few tablespoons of Earth Balance and sauté for a few mins. Then add the potatoes back into the pot with a splash of unsweetened almond milk and then mash! You can add a sprinkle of salt and pepper as well. All I had to do was pull out the balls I had prepared the night before from the refrigerator and bake them for about 30 mins. total. I baked them with the green beans while I was making the mashed potatoes. These balls are absolutely amazing! Such a treat, they are the perfect holiday main course and tasted delicious with the cranberry sauce. Note: I did not make the cranberry sauce in the recipe below, I made Food Babe’s Cranberry sauce listed above. Note: I doubled her recipe to make enough for about 8 people. Since I made the cornbread the night before, all I had to do was cut it up in little squares and put it in a basket. 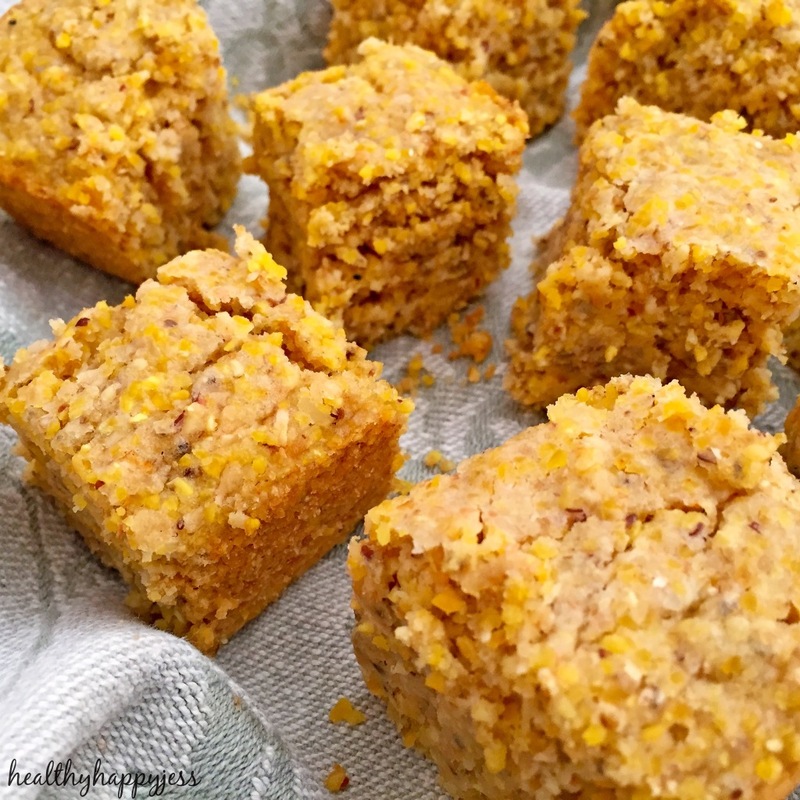 I absolutely love this cornbread recipe. It had been so long since I had cornbread and this is truly delicious…I will be making it a lot more in the coming weeks! 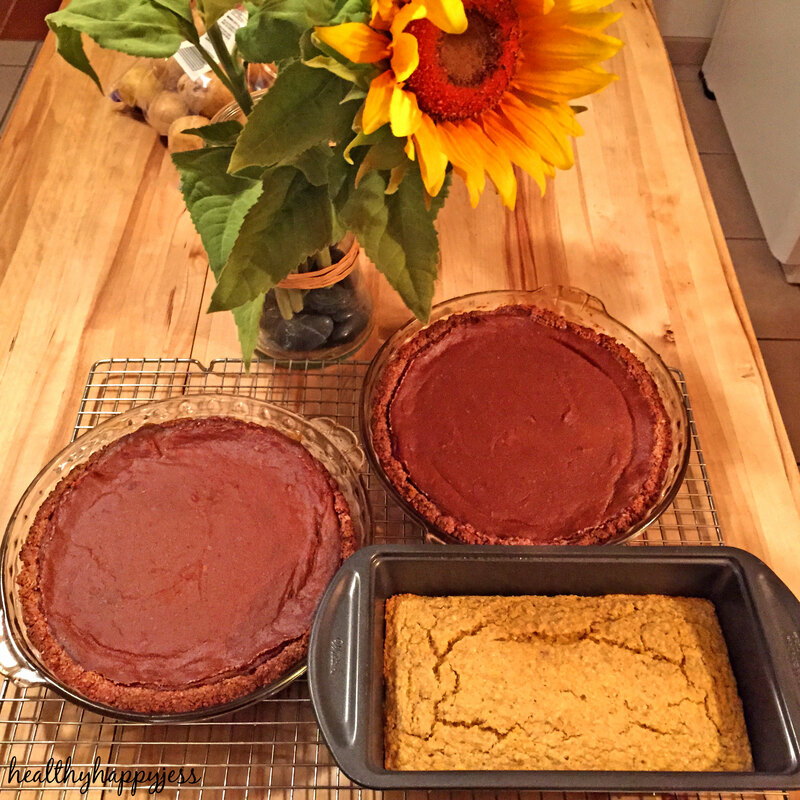 Last but not least we have my favorite part of the meal, the gluten-free, vegan Pumpkin Pie! 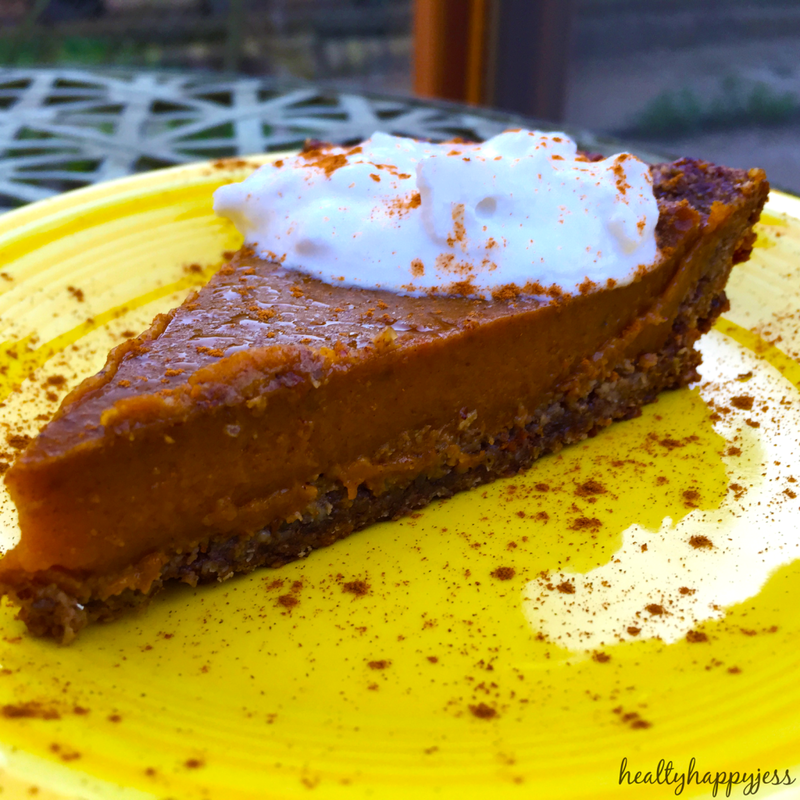 This was the best pumpkin pie I have ever had and many other people agreed. In particular, everyone loved the crust! I followed this recipe pretty closely and I would recommend it to anyone…As a matter of fact, a few people are waiting on this so here it is! I will definitely be making this again for Christmas! As I mentioned earlier, I made it the day before and pulled it from the refrigerator before serving. Note: I also made very simple Coconut Cream Whipped Cream to put on top. To make I used whole fat coconut cream that was chilled in the refrigerator the night before and with out any guar gum. Just whip the solid part (set aside water from can) with a little bit of vanilla extract and maple syrup. I want to take a moment to thank my Mom and boyfriend for all their help! I would not have been able to do it without them! Thank you!! And Thank you all for stopping by! I’d love to hear your thoughts, questions or comments on your very own Thanksgiving! I hope you try some of these recipes for, perhaps Christmas coming up? Or next Thanksgiving. 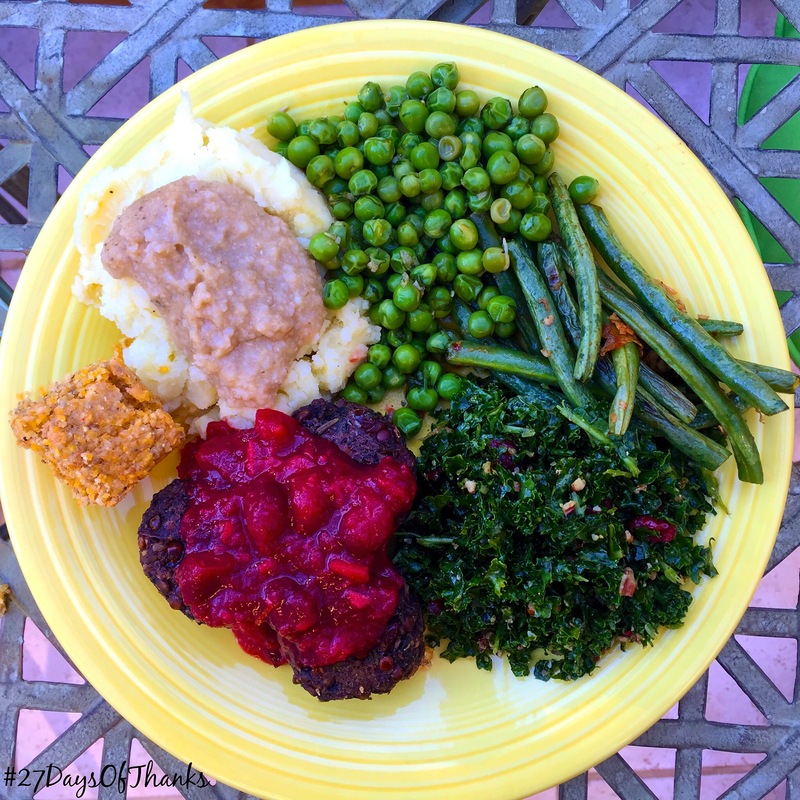 I also hope you feel inspired to try doing your own cruelty-free, healthy, plant based Holiday meal!